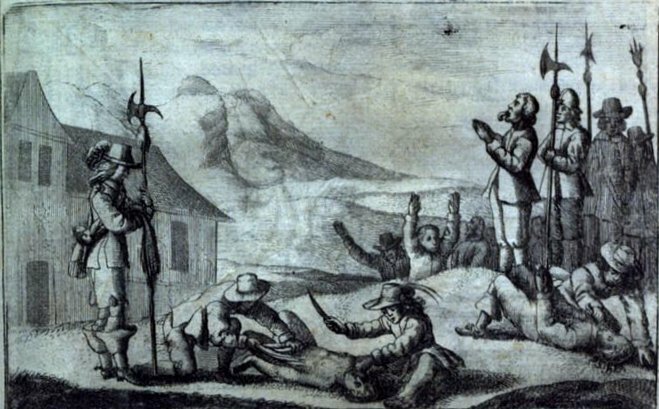 The last known witchcraft execution in Bermuda history occurred on this date in 1655. 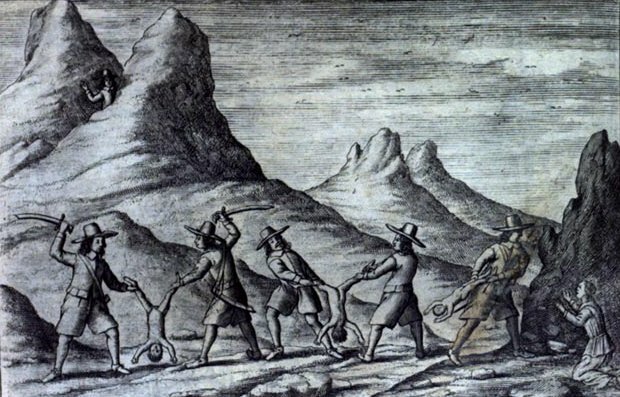 The isolated English colony was at this period laboring under social crisis, or a set of crises. 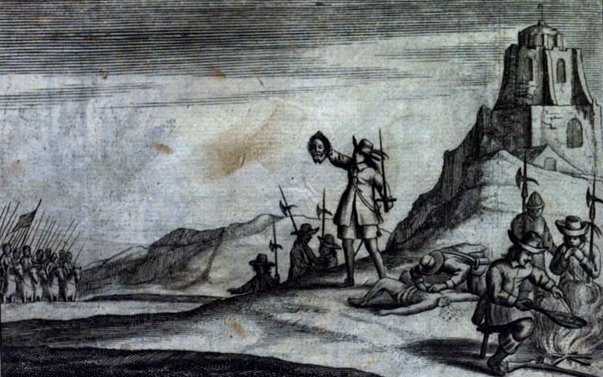 It had been declared in rebellion by Cromwell‘s parliament for taking too-vigorous umbrage at King Charles‘s execution. Its official C of E ministers were being challenged by breakaway independents of various stripes of Puritanism. The tobacco crop blew away one year. And it may have had a perilous gender imbalance (too many women, too few men: Bermuda definitely did have this problem in the 18th century). (Source for this whole paragraph) Perhaps it’s no surprise that its Puritan governor* would oversee a spasm of witch persecutions from 1651 to 1655. Jane Hopkins and another woman named Elizabeth Page were both stuck in the dock on this occasion. They’d recently arrived on the Mayflower** and the captain “did vehemently suspect them to be witches,” seemingly on account of their traveling sans male. Page bewitched the ship’s helm according to a witness who beheld her run “her finger over the compas, And yt ran round from North to South, And turned backe againe.” That’s pretty impressively infernal, but here in the 17th century they knew to look for some hard forensic evidence … so a group of matrons in Bermuda was empaneled to feel Elizabeth Page up in search of a witch’s teat. Much to the woman’s good fortune, she possessed “not any marke or spotts or signes … only something more than ordinary (in a certain place).” She was accordingly acquitted. Jane Hopkins’ body was not so ordinary. The eyewitness testimony against her was a fellow-passenger to whom Hopkins sighed that she wished God would send some sign clearing up all these suspicions of devilry. A rat — ubiquitous in seafaring life, mind you — promptly appeared. 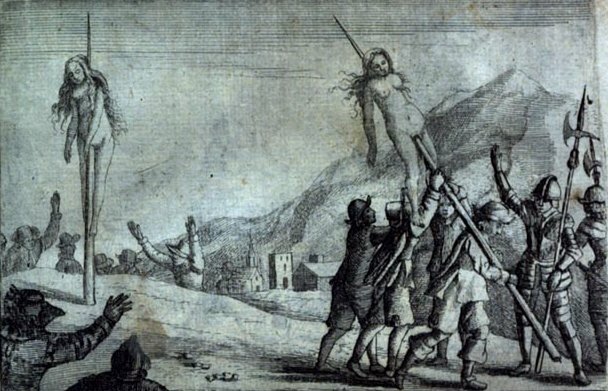 To add to this damning divine indictment, a peeping tom on the ship watching her dress had noticed some sort of mark on her shoulder. 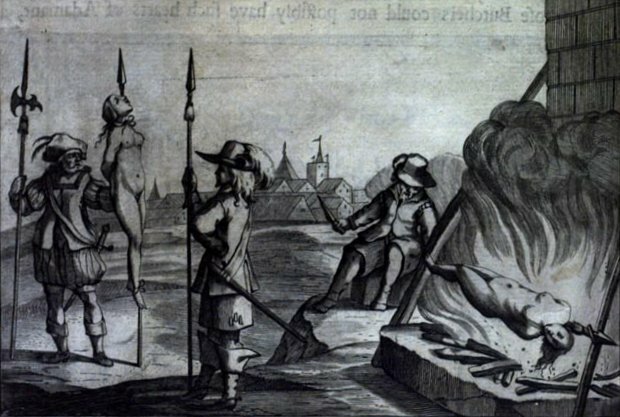 It’s not absolutely certain that Jane Hopkins was the last person executed in Bermuda for witchcraft. 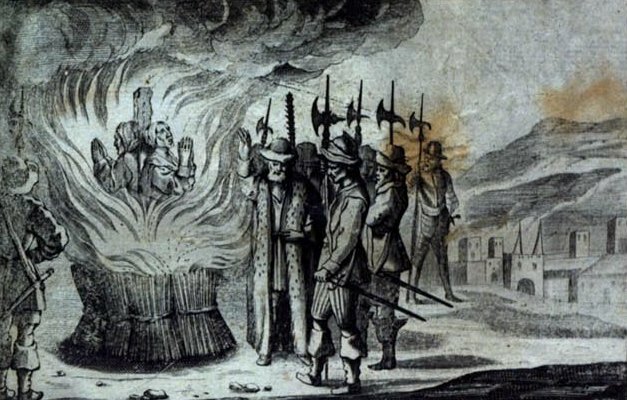 There were several additional witch prosecutions to follow in the 17th century: some ended in acquittal, others in conviction. There was even at least one more death sentence, but that hanging was stayed and the final disposition of the case is unknown. 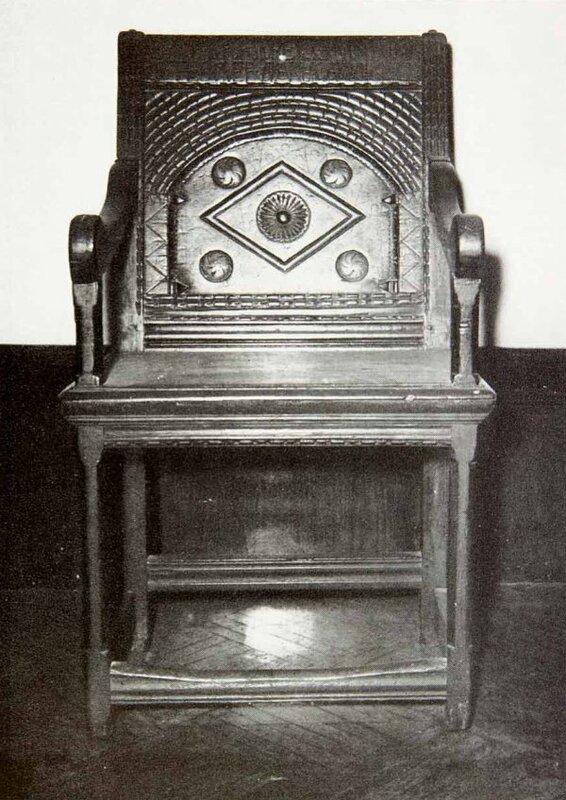 * Governor Josiah Forster’s legacy for the isles — other than hanging witches — was the “Forster Chair” made in his honor. ** Not the same ship as the Mayflower of Plymouth Colony fame.